That was one heck of a long day! It is over a month since I metaphorically put pen to paper. On the 7th January I was preparing to renew my driving licence. 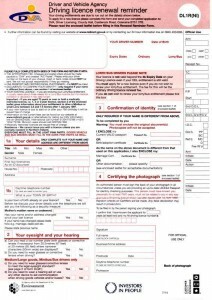 The form had arrived and it had like me, certainly changed in the last ten years. I had more questions to answer. I answered all the questions honestly and decided to drive to Coleraine on the north Coast, through a dull grey day to hand in my application form and the requisite payment for the next few years. A very helpful young man spent some time going over the form and went away to check with the medical department if I needed a form to be filled in by my doctor. I did. I came away home with my money (fee) and the medical form. That was the 18th January. I delivered this form for medical information, a payment claim form for the GP, a copy of the health questions I had ticked and a covering letter addressed to the Doctor, to his secretary on the morning of 19th January. Two and a half weeks and many reminder phone calls later… the completed form was returned to me yesterday at 5 p.m – a day before my licence was due to expire. I posted it off this morning and followed up with a phone call to the NI licensing office. They have extended my existing licence for a couple of weeks until they have vetted and checked the letter I put in the post today. Fingers crossed there will be no more hiccups. This entry was posted in 'To Do' List, Miscellaneous and tagged Driving, form filling, NI Driving Licence on February 10, 2016 by Grannymar. Have a photograph (passport size, in colour) for the renewal of my driving licence. 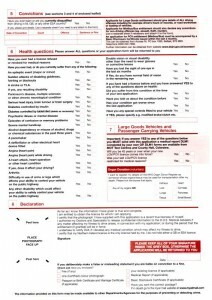 I never remember having to answer all those questions on health in past years, but it is important and necessary to keep us all safe on the road. No more ten year licences for me… I may well have to do it all again when I reach seventy years of age. This entry was posted in 'To Do' List, Miscellaneous and tagged Driving, form filling, NI Driving Licence on January 7, 2016 by Grannymar. Ella was vocal. Very vocal! She ranted at a long line of slow heavy rush hour traffic. Cyclists and motorbike riders were not spared the rough edge of her tongue either. Cars changing lanes without indicating, or any drivers who dared to cut into the small space in front of her windscreen were treated to a long stream from her litany of language more suitable to the gutter, than the front seat of an upmarket Mercedes-Benz A-Class with a twin-turbo V8 engine. Perhaps if she had been ready to leave at the pre arranged time, things might have been better. Ella WAS NEVER ON TIME. You might say she liked to make an entrance. Arriving at a theatre or concert hall with everyone milling around, would mean she would go un-noticed. Arrive late and the whole place was aware of her entry and walk right through the auditorium to take her seat in the middle of the second row! This behaviour went on for years. Her husband Ralf, was by comparison, a dormouse. His great passion in life was his car. This time, the A-Class Merc. Ralf washed and lovingly caressed it with a chamois until dry, each evening before driving it into the spacious garage to rest overnight. Some friends teased that it was clean enough to sit in the middle of the living room floor! Ralf loved his Ella. He must have. Listening to her broken record on repeat ranting, on a daily basis for thirty five years, warranted more than sainthood. He was dressed and ready, in fact Ralf had been ready for the previous two hours. A leisurely breakfast was enjoyed, the daily newspaper read and the crossword completed. The beloved car stood to attention in the driveway. The windows and lights all gleamed like crystal, even under the bonnet had a little run over with a duster. Now as he finished another cup of coffee he heard the size two footfall on the stairs. Involuntarily he tensed. The ranting (at him) began before the door to the room opened. He half wished he had given in to the sudden childish whim to hide behind the window drapes. He didn’t. They were ready for off. “I wonder if Ella remembered the marathon was on today?” thought Ralf. He was sure she had forgotten that half the roads in the centre of the city would be closed for the duration. They were not going into the city as such, but needed to drive through it in order to reach their final destination. Never worry, he had a plan. Traffic was heavy on the motor way and always slowed down as it approached the city. He had planned to take a circular route and avoid the closed off area. Of course, this was all planned a few hours earlier as he read the newspaper and saw the route the marathon would take. Ella was busy upstairs with girly stuff – hair, make-up, and which of her fifty pairs of shoes to wear. They had not spoken since Ralf had taken the breakfast tray up to her a few hours earlier. Ella liked breakfast in bed. Ralf liked that too. It meant a calm quiet start to his day as he sat to eat alone at the kitchen table. “You are in the wrong lane!” bellowed Ella. “You should be over there, in that one.” The ranting had begun, and it continued. The higher the rant the slower the traffic moved, until it finally slid to a halt. Nowhere to go. At this stage Ralf was behind an articulated lorry, in the rear view mirror he could see a wall of lorries approaching. One stopped behind him, and another two drew up along each side, They were completely surrounded. Ella did not like being closed in, she was claustrophobic at the best of times, the ranting reached a crescendo. This outing was not his idea of fun, he would have much preferred to potter about at home for the day. He switched off the engine – they were going nowhere. They could not, even if they wanted to. Slowly, calmly and silently, Ralf opened the driver’s door and got out. He put the keys in his pocket, closed the door and turned without a backward glance and walked away. Road Rage was suggested by Padmini, who I am sure is a perfect passenger and would never rant while her husband was driving. She has re appeared from the shadows to rejoin us, despite being busy with family commitments and other pursuits. I look forward to reading what she and all the other active member have to say on the LBC topic, for this week. This entry was posted in Loose Consortium Blogging and tagged Driving, Kiss me Kate, LBC, Loose Blogging Consortium, Mercedes-Benz, Road rage on November 8, 2013 by Grannymar.